Russell's Hobbies | Read about my chickens, my bees, my crabs, my garden and other interests I have accrued over the years. They say if you ask 10 beekeepers the same question that you will get 11 answers because one beekeeper will change his mind. This leads me into two questions of 1.) in cold weather what is the actual temperature that bees start to cluster and 2.) at what temperature do the bees break cluster? A google search gave me many different answers and it seems nobody has the real answer, only an opinion. I have over 35 beekeeping books in my library and most of them differ on this subject. Some researchers have used an infrared camera to take pictures of the inside of a hive but an infrared camera does not yield an instantaneous temperature answer because as soon as you enter the hive and remove a frame the temperature changes. Another problem is an infrared camera only shows shades of different colors for temperature differences but no actual measured temperatures. The infrared camera pictures are left to the interpretation of the person analyzing the pictures. My problem is I want to fix my hives so my bees don’t need to cluster in the winter except for very short periods of time so I thought adding a heater to the hives would be a good possible solution. It takes a lot of energy and honey stores for bees to cluster to raise and maintain the temperature of the hive. I am not the first person to try this approach of using a heater but with my ‘unique inner hive cover’ I can check the temperature in real time of my hives, check on my bees, and evaluate if my heaters are working and not disturb the bees in the process. I originally made my first heater using an insulted aluminum tube attached to a board with a 60 watt bulb in the bottom of the tube. After all this work, I discovered the D-FLIFE heaters on amazon so I switched over to them. (link to heaters on Amazon). The description of my heater idea and results is demonstrated in the attached youtube link at the bottom of this blog entry. I decided to place the D-FLIFE heaters below the screened bottom board of my beehives since heat rises so there was no need to place heaters inside the hive. I installed heaters for 7 hives (6 hives with bees and one empty hive). I used an empty hive to test what the temperature of the hive would be without bees for a comparison. The heaters are turned on/off with a thermostatically controlled power source set at 55 degrees. I have taken the actual temperature measurements of my 7 hives over a period of time, here is the youtube link to my heaters and the result of a test on Dec 13, 2017. I only show the results of one hive because all 7 hive temperatures were pretty close. As shown in the video, I have had no issues with condensation in my hives, else the plexiglass top would have condensation on it. I will monitor my hives frequently from December through April and I will post the final results in April 2018. This weeks project is I am propagating hardwood cuttings of Rose of Sharon. This will be an interesting test since I will put half of the cuttings in rooting hormone gel and the other half in my honey. I plan on making >125 cuttings. Next week I will start building a heated propagation bench that I saw on youtube. I plan on starting all my pepper, tomato, cucumber, and squash plants from seed using my propagation bench. It took me a week because I was learning how to use a video editor named shotcut (it is a free, open source, cross-platform video editor) and somehow I messed the program up and I hid important menu items (file, edit, view, settings, and help), and without these I was screwed. I removed and reinstalled the program many times but I could not get shotcut restored to what it was like when I first installed it, even the ‘restore default layout’ button wouldn’t fix shotcut. My son figured it out for me, there is a file that keeps track of how the window is laid out and this file does not get removed or updated when you remove and reinstall the program. Shotcut is a very easy program to use once you have played with it and figured how to use it. I am excited about using my Mavic Drone videos and adding text to the video so I won’t need to talk. It has been nice weather so I have been catching up on a lot of outside chores. I visited my oldest son on 12/3 to drop off some Xmas stuff and spend some time helping decorate the Christmas tree. I drove on the beltway and then on I-270, some of those Maryland drivers are very aggressive. I finally have cable internet installed at my house (I was using my cell phone as a hotspot and it hardly ever worked correctly) and I recently bought a laptop computer so I can now start updating my blog on a weekly basis. My original plans were to start posting weekly starting Jan 1st, 2017 so I am only 11 months behind my original goal. I will do a much better job in 2018 now that I have all my ducks in a row. I retired on Dec 30, 2016 and the first thing I did on Dec 31, 2016 was to purchase a Golden Retriever puppy. A good friend of mine was very kind and drove me to West Virginia to pick up the puppy (we both bought a puppy from the same breeder). I figured I would need time to house train the new puppy and I did not want to leave her in a crate all day while I was at work. I figured house training would be a chore, but it turned out to be the opposite. My neighbors daughter picked the name of Callie for my new puppy. I would walk Callie and click and treat her (I used the clicker training method) whenever she did her business. I also hung a bell from the door handle and I would ring it before I took her outside and she almost instantly would ring the bell when she needed to go outside. 11 months later and she has not had a household accident in all that time. What’s ahead for 2018? I have lots of plans for the coming year so I hope I can keep you entertained with something interesting to read about my hobbies and watch some youtube videos and view some interesting photos. I also bought a Mavic Pro Drone and I will be filming some aerial videos of Colonial Beach and things I think that may be interesting and entertaining. I am still in beginner mode with my Drone, I am a little bit afraid of crashing it. Things I will cover in 2018 will be my honey bees, my garden, my crabbing operation (both hard shell and soft shell where I have tanks to shed the crabs), my chickens (I have 17 now but I plan to get about 10 more and house them in a chicken tractor so they can weed parts of my garden for me). I have ordered 3 nucs from mdbee.com, so I will be increasing the size of my apiary. The nucs should be ready for pickup in April; I will make a youtube video of me installing the nucs into my apiary. What is in the plans for my next post? I will cover my transition into retirement and lessons learned. I had big plans to post on Jan 1st but I was so busy. Retirement has been a real life experience because I have spent the last 47 years of my life dedicating most of my time to work. I entered retirement on Dec 30th and on Dec 31st a good friend of mine Colleen was so kind and drove me to West Virginia to pick up my new puppy (Callie). I paid a little extra for the breeder to keep her for a couple of extra weeks (she was born on Oct 6th), I did not want to get a puppy and stick her in a crate for >10 hours a day while I was at work. I am starting 2017 off with many projects. A bigger nice weed free garden, starting my tomato and pepper plants from seeds, building a bigger chicken pen, increasing from 2 soft crab shedding boxes to 4, getting more bees (I ordered 5 nucs for 2017), replacing my front yard grass with sod, planting my remaining grass with clover and bee friendly plants, building my own crab pots, continue running and exercising (2 races planned for 2017, the MCMHH in May and the Marine Corps Marathon in October), starting many Rose of Sharon bushes and lavender plants from cuttings and then making a really large area of Rose of Sharon and lavender plantings for my bees, replacing my kitchen and living room floors with that snap together flooring, build a dog pen (not to keep them in, just an area so I can confine their bathroom breaks and cleanup the deposits easier) and sell some of my wares at the farmer’s market. Last year I used 3 lb coffee cans and drilled holes in the bottom and I put a coffee can by each watermelon and tomato plant and I just filled the coffee can with water to water my plants. This worked so well that this year I am going to use 5 gallon buckets and surround the buckets with 4 plants and also add squash plants (pictures to be posted later). 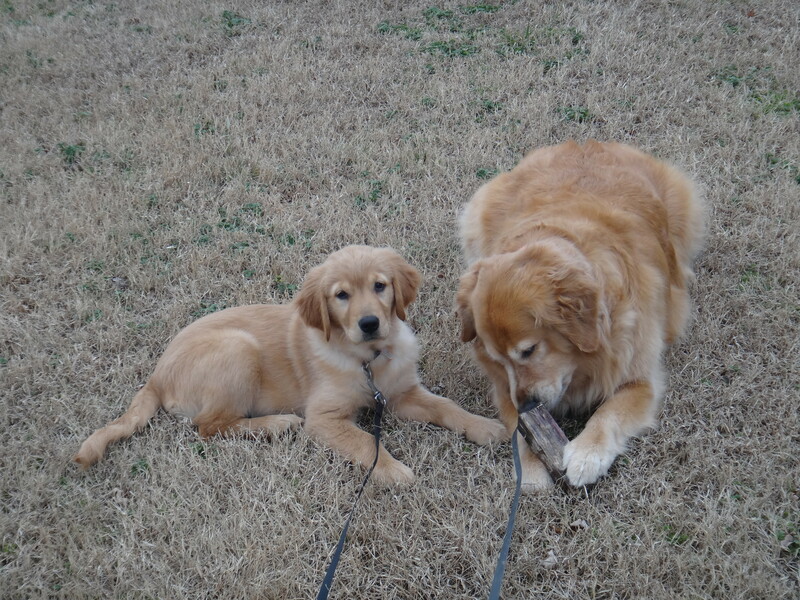 A picture of the new puppy Callie and my 6 year old Golden Brandi. I am retiring on Dec 31, 2016. I plan on updating my blog every Sunday starting Jan1, 2017 with what I am doing in retirement, how I occupy my time, status of all my projects and anything else that I think people will find interesting. 1. I did not meet my 2016 goals and most of my bees died so I am starting 2017 with a bunch of new goals. 2. I will order 6 bee packages for April 2017. For 2017, I will make youtube videos of everything from picking up the bees, installing the bee packages, and showing how the bees do for the year 2017. 3. Plant another huge vegetable and herb garden (hopefully very few weeds this year) and try a bunch of new recipes with the bounty from my garden. Plant a large bee friendly flower garden in addition to my regular garden. 4. My hobbies for 2017 will be: build all my own crab pots, increase my soft shell crab operation to 4 shedding tanks (pictures to be added), crabbing (6 days a week), taking care of my chickens (build a chicken tractor), expand my garden, catch catfish to sell, sell my wares at the farmer’s market (not decided which one I will use), and make some youtube videos of my hobbies and some videos with my Mavic drone with me crabbing, fishing, beekeeping, gardening, dog training, and anything else that I think will be interesting for people to watch. 5. Continue running and working out. Planned races for 2017 will be New Year’s Day Resolution Race, Marine Corps 17.75K (in April), MCMHH (in Fredericksburg in May), and the Marine Corps Marathon (in October).